As the All-Star Game begins tonight, MLB is on its way into the second half. As usual, a lot of talented young players have made their presence felt, as players like Juan Soto, Gleyber Torres, and Ronald Acuna have positively impacted their clubs, giving new life and new blood to their clubs. This new list of prospects is an update to the top 100 from the preseason! To say that the last three months, since I last wrote on this blog, have been miserable would be the understatement of my lifetime. Personal issues aside, I can easily say that the 2016 World Series was the best that I’ve ever seen. As a former writer on an Indians blog, I adopted them as my team – and was forced to do so after the MLB.TV blacked out my local team. Watching the Tribe all season, off-and-on due to the above issues, was truly exciting. The Tyler Naquin inside-the-parker and celebration, the year-long smoothness of Francisco Lindor up-the-middle, and the dominance by Corey Kluber were impressive to cling to during my own struggles; however, the Indians making it to the World Series and getting that 3-1 lead was what I thought would bring me out of the funk of life. Unfortunately, it didn’t happen that way, but…WOW! Rajai Davis‘ home run, the ups and downs of the whole series, and the hope that came along with it…It didn’t get much better than that. Congratulations to the Chicago Cubs and the 108 years of futility that their fans had to endure for their majestic comeback. 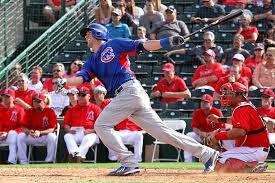 It is scary to think of how good they could be over the next several years as Kris Bryant, Anthony Rizzo, and Javier Baez blossom in their dynamic lineup. Of course, the owners want to take this time of great celebration and success for the entire league to leap into their demands. Sure, the International Draft and all of the international signings need to have some sort of reform. The punishments of signing money and draft picks haven’t seemed to do enough damage to the clubs that continue to shell out the millions needed to sign the top international teenagers. A draft would “even the playing field” and allow the worst teams to get the best players. Isn’t that similar to the amateur draft, though? Are the best players going in order in the draft, or are the teams using their bonus money and the demands of the bonus babies to still play a role in who they take? This is a problem, sure, but all player acquisition options seem to be that way in MLB. People didn’t like the way that the Houston Astros lost and stockpiled players. The Cubs did something similar and found the results that they did in 2016. Are the Cincinnati Reds next to go down the hundred-losses path to find eventual success, or will the owners cry foul on that, as well? There are all kinds of other options that need to be adjusted, but equality and fairness in dollars, which comes along with a salary cap, will only go so far if stupid people are in charge. The Indians ranked 24th in MLB payroll on Opening Day last season, while the Cubs were 14th, just behind my hometown Reds, who went 68-94, just 35.5 games back of those Cubbies. The owners, the billionaires, want more money coming towards them, which makes the International Draft and a salary cap so endearing to them. The players, the millionaires, want more money in the only league that has fully guaranteed contracts – just imagine what would have happened to a Ryan Howard contract in the NFL! Once again, it could be the game and the fans who lose out while these rich people banter over their money. The game continues to grow globally, with another World Baseball Classic this spring, but all of the positivity that comes from that jubilance could be crushed. So, here’s my take: get over yourselves and take better care of the game, and don’t ruin this amazing high that fans are on after an incredible postseason with arrogance and greed! Cecil cashed in – not bad for a setup man. After watching Andrew Miller dominate down the stretch and in the playoffs, the St. Louis Cardinals dove into free agency with what could be a huge belly flop, signing Brett Cecil for four years and $30.5MM to get the ball to last season’s surprise closer, Seung-hwan Oh, who was dominant after replacing Trevor Rosenthal last season. Cecil is an interesting investment. After faltering as a starter for Toronto, he was moved to the bullpen full-time in 2012. In his four seasons of serving only out of the ‘pen, Cecil has managed a 2.90 ERA (2.73 FIP), 1.17 WHIP, and 11.5 K:9 over 205 IP and 243 appearances. If you compare Cecil’s four seasons to Miller’s first three as a reliever, they are pretty similar, as Miller posted a 2.57 ERA (2.37 FIP), 1.05 WHIP, and 13.3 K:9 over 133.1 IP and 163 appearances. Miller, of course, signed with the Yankees for four years and $36MM after the 2014 season, becoming more dominant since then (1.72 ERA (1.90 FIP), 0.76 WHIP, and 14.8 K:9 over 136 IP and 130 appearances). It appears that Cecil was able to successfully attach himself to Miller’s coattails, riding them to a huge payday. Jumping to the outfield, the Astros added to their’s by signing Josh Reddick to a four-year, $52MM deal. It seemed like a strange addition when you consider that the Astros have George Springer in right, the position that Reddick has played for most of his career. Still, with Jake Marisnick in center and Nori Aoki in left, the outfield was an area of need this winter. After going from Wild Card winners in 2015 to 3rd in the AL West in 2016, the Astros needed to continue to push towards their winning window with their solid core of talent. Reddick, however, may not be worth $13MM per season, having seen his best season way back in 2012. It seems like a lot of money for someone who posted a 1.2 WAR in 2016, but it appears that Houston believes his thumb injury played a larger role in his lack of offensive prowess last season. This looks a lot like the deal that the Yankees gave to Jacoby Ellsbury, banking on his insane 2011 season after a couple of average seasons in 2012 and 2013. He hasn’t lived up to the contract, unless you’re paying $20MM per year for past performance, which Houston appears to be doing, as well, this offseason. I’ll try to write more often. Get back on my bandwagon and I’ll tell you wonderful things about baseball and life. America needs me right now, so I’m back. Gattis doesn’t really make sense in a bounce-back spot due to posting an .810 OPS in 2014. After all, he hit 22 home runs in just 108 and 401 plate appearances. However, people seemed to sour on the slugger due to his ineffectiveness behind the plate, as he allowed 53 stolen bases and threw out just 20 percent of would-be base stealers (league average was 28 percent). Gattis, though, was likely miscast in that role anyway, and his move to the American League presents the opportunity to DH, especially with the Astros having Jason Castro, Hank Conger, and Max Stassi as options at catcher. Gattis will likely play left field a majority of the time, keeping Chris Carter at the DH spot, but this will allow Gattis to play every day. Based on his power numbers, you’re looking at a left fielder with 30 or more home runs in a quickly improving Astros lineup. While he may not be “bouncing back”, Gattis will certainly be jumping forward with his most productive season, as he is in his prime (age-28 season) and will get plenty of at bats. Some fantasy fans will be scared off from Singleton due to his .168 batting average and the fact that he struck out in 37 percent of his at bats in his 2014 season; however, you can take advantage of his faded future stardom by others jumping off of the bandwagon. There were several positives in his atrocious .168/.285/.335, mainly his 13.8 percent walk-rate and his .168 ISO, which would have matched Adrian Beltre and Hunter Pence for right about 55th in MLB (if he had enough plate appearances to qualify). Additionally, Singleton’s .238 BABIP showed quite a bit of bad luck, and some of those balls may fall (or fly out of the park) in 2015. Plus…Singleton had a 20.7 percent infield fly ball rate, which would have led MLB – if that is something that someone actually “leads”. He won’t turn 24 until the middle of September and he has a ton of power, patience at the plate, and a team willing to play him despite the strikeouts (see Carter, Chris) – if they don’t go away. Offseason Overview: The Astros were able to get 3B Luis Valbuena and RHP Dan Straily from the Cubs for Dexter Fowler, while acquiring OF Evan Gattis from the Braves for a package of solid prospects (3B Rio Ruiz, RHP Michael Foltynewicz, and RHP Andrew Thurman). They signed OF Colby Rasmus and SS Jed Lowrie, and, suddenly, the team has another fresh look. The Gattis trade may go down as a steal for the Braves (Ruiz is very good and Foltynewicz has the arm to be an elite reliever if he doesn’t make it as a starter), but Matt Dominguez still has four seasons of team-control (including this season), and the club acquired Colin Moran from the Marlins last season, so the depth was there. The deals that they made provided a lot of depth, as Houston has three very good options at catcher, Dominguez and Valbuena can share third and be productive, while Rasmus appears to be a bench player if he is unable to beat out Jake Marisnick for the job in right, as Gattis should be in left and Springer will be in center. We will see if the philosophy that Jeff Luhnow has developed ends up working, but this winter definitely improved the roster. The Verdict: PECOTA sees the Astros falling back into the AL West cellar, and with the rotation that they have, that seems likely, but they’re also predicted to win SEVEN more games than they did in 2014. While they’ll still have one of the lowest payrolls in MLB, the organization appears ready to make moves necessary to improve the team, even dealing away pieces of their future due to the tremendous amount of depth that has been created within the system. Slowly but surely, the Astros are getting there. We’re another season away from seeing RHP Mark Appel, SS Carlos Correa, RHP Vincent Velasquez, and OF Brett Phillips in major roles for the big league club, and once they are there, the rebuild will officially be on the verge of taking the leap to contention. Until then, it’s another season to hope for positive gains and see if the Astros make a run at some of the huge names who will be available next winter. The Astros Fire Manager for Failing? Why fire someone who was bound to fail? 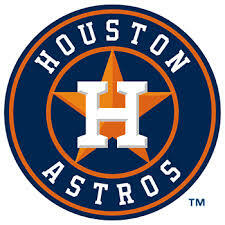 The Houston Astros have been historically bad since the start of the 2011 season, losing 100 games in each of the last three seasons. 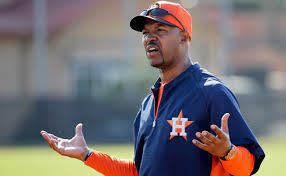 This season, the squad is 59-79, needing just four wins over the next 24 games to avoid a fourth such disastrous season, but it wasn’t enough to save the job of the Astros’ manager, Bo Porter. Porter was, ironically, relieved of his managerial duties on the day that we all celebrate the hard work and efforts of those in the labor force. The Astros have relieved Bo Porter of his managerial duties. Tom Lawless named interim manager. Porter’s squads have not been good, going 110-190 over the last season-plus (.367 winning percentage), but it didn’t have a lot to do with what Porter was doing on the bench. Ken Rosenthal recently reported tension between Porter and General Manager Jeff Luhnow stemming from Mark Appel making an appearance in Houston for a bullpen session for Astros’ pitching coach Brent Strom that Porter had to explain to players on his roster, who were upset over the struggling prospect’s possible special treatment from the organization. Beyond that issue, there appeared to be some separation from the analytical team at the top of the organization and what was being done from the bench by Porter, which was creating relationship woes within the organization. The Rosenthal piece details those woes at greater lengths, but the firing of Porter clearly wasn’t for what he was doing on the field, as he can’t be held accountable for the recent failures of the franchise. 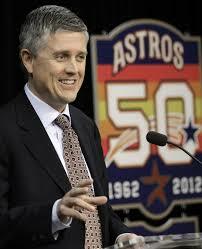 Luhnow, hired away from the St. Louis Cardinals in December of 2011, developed an awkward approach to rebuilding the Astros’, essentially gutting the entire roster and eliminating as much payroll as possible to field a horrific team that would be capable of landing high-upside talent through the draft, while building the farm system and promoting talent from that pool to compete for championships within a window. Upon taking the position and immediately producing horrific seasons, the team was able to “earn” the No.1 overall pick in back-to-back seasons (after having the No.1 overall pick in 2011, which Luhnow used on Carlos Correa), Luhnow’s plan was becoming somewhat relevant, as the Astros will, likely, finish ahead of the Texas Rangers in the AL West in 2014, barring some kind of sudden change from the injury woes to the Rangers’ 2014 season. Porter, though, had done well with what he had. He and his coaching staff had guided a very young, inexperienced squad to some very high peaks among the very low valleys, watching Jose Altuve become a star, while handling the franchise’s quick rising future stars, as Jon Singleton, George Springer, and Jake Marisnick had arrived to showcase their talents at the Major League level. He had very little control over the day-to-day roster, watching Jarred Cosart, one of his top pitchers, get dealt at the deadline (which brought Marisnick but didn’t help the pitching staff), while having limited options in the rotation and a horrific group to run out of the bullpen. Of course, Porter was bound to be limited in his roster, as the club wasn’t going to call-up a player sooner than necessary and risk service-time becoming an issue, especially as the team continued to try to limit their expenditures. Perhaps the complete breakdown of the roster was too bold, and perhaps the club had a manager with too much emotional attachment and fire to sit back and wait for the Astros to build a team that he could truly manage successfully. Regardless, what looked like an intelligent move in guiding the Astros to become what Sports Illustrated called the 2017 World Series Champions, suddenly became much more complicated, and whether Bo Porter was actually part of the long-term plan or not, his firing has created a lot of questions about the long-term goal of the Astros’ organization, as well as the ability for Jeff Luhnow, who was so quickly admired for his plans, to work well enough with those around him for his ideas and visions to become a reality. Bo Porter didn’t fail as a manager of a horrible team, he failed at working with an ego that had grown beyond repair. Jeff Luhnow must now build this winner from the front office and the field, as he has no one else to blame for the team’s future struggles but his own actions and decisions. 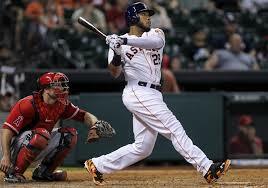 On March 22, 2014, the Houston Astros released J.D. Martinez. Yes, the cheap, slowly rebuilding from nothing Houston Astros had seen enough out of a 26-year-old outfielder after three seasons and 975 plate appearances in Houston. Although the Astros have promoted George Springer, who has been very productive in his short time in the majors, Houston should weep due to the old hindsight massacre that Martinez is creating for them, as they run out Robbie Grossman and Alex Presley in left field these days. J.D. Martinez has developed into a monster. An offseason of swing adjustments that led to dropping his hands in his approach to keep the bat in the zone longer has led to an offensive outburst that no one was expecting. After those three seasons in Houston, Martinez had a .251/.300/.387 triple-slash, with 44 doubles, three triples, 24 home runs, and a whopping 226:63 K:BB. Sure, he may not be Jose Bautista, but Bautista was tossed aside after posting a .239/.324/.398 triple-slash over his first 1,634 plate appearances, ending up with trade to Toronto prior to his age-28 season in 2009, which led to a change in his production after a similar swing adjustment. The Tigers have reaped the benefits of gambling on J.D. Martinez and his new approach, as the right-handed hitting “slugger” has settled in nicely in the fifth spot in the order behind Miguel Cabrera and Victor Martinez. After another solid game on Wednesday night against the Texas Rangers, Martinez has a 14-game hitting streak. After going 2-for-3 with a double, home run, and a walk, Martinez is hitting .418/.431/.891 over his hitting streak with eight doubles, six home runs, and 17 RBI, bringing his season line to .322/.359/.653 to go with a .370 BABIP, .430 wOBA, and 175 wRC+ in 131 plate appearances. 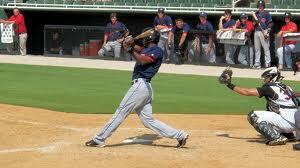 The production at Double-A in 2011 led to the promotion to the majors for J.D. Martinez, and it was warranted. He wasn’t totally overmatched at the major league level, either, posting a .742 OPS and 104 OPS+ over his first 53 games and 226 plate appearances in Houston, but he seemed to press in 2012 and 2013 at the major league level, posting a .245/.295/.376 triple-slash with 18 home runs, 31 doubles, and 91 RBI over 749 plate appearances to go along with a 178:50 K:BB. At 25, the Astros had seen enough, which is odd considering that he was pre-arbitration (not eligible for arbitration until after the 2015 season, which is good timing on his part for his breakout), and could have had his contract renewed for close to the league minimum. 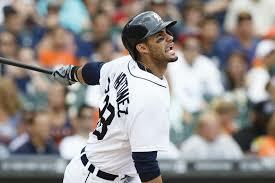 Regardless, it is 2014, Martinez is finally getting a chance, taking over the full-time left field job from Rajai Davis and Don Kelly, while giving the Tigers another offensive force in the middle of the lineup. While Ian Kinsler looked lost at times in Texas and Prince Fielder‘s absence was worrisome for the future of the Detroit lineup, the Tigers seemed to have replaced the production with a rejuvenated Kinsler and J.D. Martinez looking like an All-Star as potent replacements to that “lost” production, as Fielder is shelved for the Rangers after having neck surgery in May. The 2014 season has been quite interesting to this point. With so many teams floating around contention due to unforeseen parity in a game that has had so little over the years, we haven’t seen many top talents reach the big leagues to assist their clubs compete. Gregory Polanco finally reached Pittsburgh, but the Cardinals just sent Oscar Taveras back to the minors following the activation of Matt Adams from the 15-day disabled list. With injuries to Byron Buxton, Miguel Sano, Archie Bradley, and Taijuan Walker, the elite level prospects haven’t provided a lot of positive material for minor league analysis. For that reason, you have to reach deeper. Here are some names that you may be familiar with, but, if you’re not, you should get to know a little better. Bryant is a one-man wrecking crew in the Double-A Southern League in 2014, and you should already be familiar with him, as Bryant was the No.2 overall pick out of San Diego in the 2013 MLB Draft. For all of the fears that went along with the holes in his swing, which is still present based on the 75 strikeouts, Bryant can still draw a walk while producing elite-level power from the right side. He may have to move to an outfield corner in the long run due to Starlin Castro being at short and Javier Baez likely moving to third, as the Cubs have Anthony Rizzo locked up through 2021 (including options) at first. Regardless of where he plays, he’ll be an All-Star talent. The Cubs don’t need to bring him up due to their 27-38 record and ongoing rebuild, but the scariest part of his numbers are the fact that they could only get larger with a move to Triple-A and the Pacific Coast League. He could break camp with the Cubs in 2015 and will likely get a nice audition this September. The Mariners have a lot of young pitchers who get a lot of attention with Taijuan Walker, James Paxton, and Erasmo Ramirez each earning some starts at the major league level over the last couple of seasons; however, with those names receiving so much attention, there is a sneaky exciting talent coming up who isn’t getting nearly as much recognition as most players with his skills would, and that is Victor Sanchez. At 19, Sanchez is already in Double-A, having skipped the horrific pitching environment of the California League, and he is pitching very well. Over his last two starts, Sanchez has allowed just two earned runs over 13.2 innings (1.32 ERA), striking out 13 and allowing 11 base runners (0.80 WHIP). Sanchez isn’t a dynamic strikeout pitcher, but he has plus command and, at his age, he may further develop his stuff to take another step forward. He could certainly give up fewer home runs, but when you consider that he is 5 1/2 years younger than the average player in the Southern League, he deserves a break. He’s a very mature pitcher given his age and deserves more attention than he is getting. 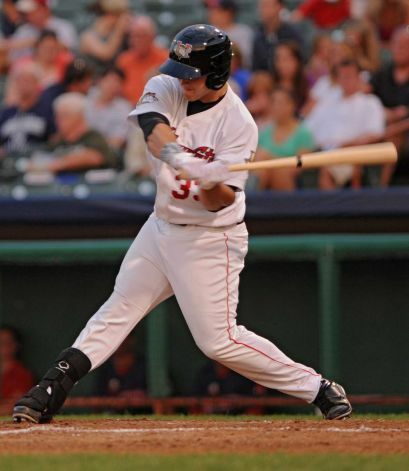 Another Houston Astros prospect who is near ready to make an impact at the major league level, Tucker was just promoted to Triple-A after being near the top of the Texas League in doubles, home runs, and total bases. After thriving in 2013 between High-A and Double-A, Tucker has made the adjustments necessary to continue his progression to Houston to join Jon Singleton and George Springer, while the club waits for Carlos Correa and others in the lower minors to help make Houston a World Series contender in the next three seasons. Even thriving against left-handers, Tucker is capable of being more than just an average outfielder in the majors. After being taken in the 4th round of the 2012 MLB Draft out of South Carolina, Christian Walker had a somewhat productive first full minor league season in 2013 (.815 OPS, just 67 strikeouts in 439 plate appearances), but it was also somewhat disappointing (11 home runs). Walker did play at three levels in 2013, so, perhaps, he wasn’t in one location long enough to make the adjustments necessary to showcase his power, but the 2014 season has been quite different. Walker already has 17 home runs and is sporting an OPS of .913 as of publishing. While his strikeout rate has increased, that is allowing him to produce at higher levels. With Chris Davis under team control through the 2015 season, could you be looking at the future first baseman in Baltimore? It could be the case, but Walker has to continue his offensive outburst if he is going to make it in the majors as a right-handed hitting first baseman. Even after missing all of the 2013 season due to Tommy John surgery, Rymer Liriano is young for his league. The 22-year-old outfielder is back on track, showcasing all of his tools, though the swing and miss looks to be a bit larger than anticipated after his long layoff. Regardless, in 2011, Liriano showed the speed (66 steals) and power (50 extra-base hits) that make fantasy baseball fans salivate. He could probably make the Padres offense a little better if he were called up today, but he still has some work to do to become an All-Star level talent in the future. Prior to the 2013 season, Jackson was heading towards becoming an organizational arm, even though he was a first round draft pick in 2010. Then, it all seemed to click last year and over his last 200.1 innings he has a 2.34 ERA, a 1.10 WHIP, and 208 strikeouts. Now, with the Texas Rangers reeling and in need of pitching depth after injuries to Derek Holland, Martin Perez, and Matt Harrison, Luke Jackson has positioned himself for some time in Arlington at some point this summer. Michael Taylor is breaking out. After an impressive repeat of High-A in 2013 (57 extra-base hits and 51 stolen bases), Taylor has reached a career-high in home runs in just 62 games, while still showing tremendous speed (17 steals) in his first go-round in Double-A. There is a lot of swing and miss in his bat, but the power and speed skills that he possesses make him an intriguing prospect, especially when you consider that he could be in a pretty electric lineup with Bryce Harper, Anthony Rendon, and company in the next couple of seasons. With Denard Span due a $9 million option or a $500,000 buyout in 2015, Taylor is likely leaving a lot of questions for Nationals General Manager Mike Rizzo and Washington management about just what to do in center field in 2015. If nothing else, Taylor could spend some time in Triple-A next year, or even later this season, before earning a full-time role in 2016. Jake Lamb was a 6th round pick out of Washington in 2012, and all that he has done since getting drafted is hit. This season, his numbers in the Southern League are being mocked by Kris Bryant’s absurd outburst, but they are still very, very good. The doubles and home runs show the power potential in Lamb’s bat, and the .996 OPS in 59 at-bats against left-handed pitching shows that Lamb is quite capable of becoming a regular in Arizona. With Kevin Towers around, Lamb could be traded before ever reaching the desert, but he would be an extremely solid option to force Martin Prado off of the hot corner, and joining Paul Goldschmidt as a tremendous offensive threat in the Diamondbacks lineup in the near future.